Anorexia almost claimed the life of 18-year-old Lara Rebecca but her story of recovery two years later has attracted a massive audience. She uploaded one video to social media about her battle overcoming the eating disorder and it has had almost seven million views in three weeks. 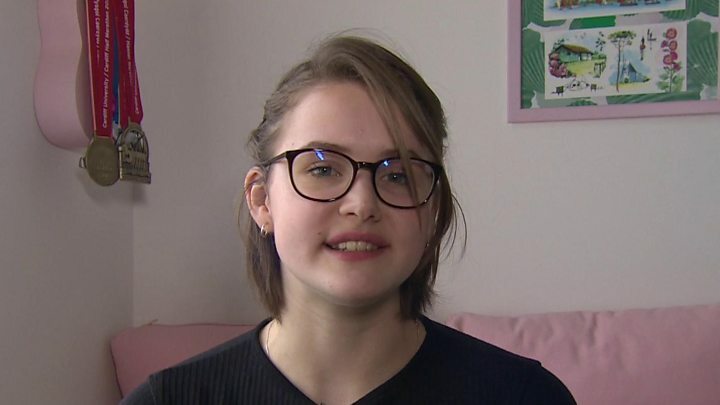 Lara, from Cardiff, said she had been a happy child but started restricting her diet as a teenager as a way to cope with her feelings and it became her "downfall". "It was a coping mechanism," she said. "I felt extremely isolated, but it was a sense of control, a way to somehow gain control over my chaotic life at the time. "The only way I could almost understand these feelings and deal with these feelings and regain the need of a sense of structure was through my eating and, unfortunately, that lead to my downfall to anorexia." Can you talk about self-harm online safely? Lara said she was admitted to hospital at the age of 16 and her family and doctors feared for her life. She was flown home from a family holiday in order to get treatment. "It was supposed to be a two week holiday to France, and two days in it went from worse to even worse," she said. "I ended up locking myself in the toilets, actually for hours on end, just to cry and as an excuse not to eat. "I basically starved myself for a very prolonged period of time and it took me to the point where I had to be flown home. "I was put on the first flight home to the UK and I went into treatment." When she was most ill, she had a body mass index (BMI) of 13, well below what is considered healthy for a girl of her age. She documented her weight loss with photographs. "I remember the mindset I had when I took those photos, and what I saw, and now seeing what is true, it's extremely terrifying," she said. "To think I was so motivated to lose further weight and now I can't even see where I could have lost any further weight. "It was very scary, very terrifying and now I just want to jump back in time and give myself a hug." Recovery was slow and incremental over two years but Lara has turned her life around. Over time, her relationship with food has improved and she has started exercising. Now she feels confident and happy. "I developed a personality back, I was the Lara I always had been rather than this anorexic girl that was really depressed and really anxious. "So it was socialising and seeing friends and seeing an opportunity to get out of it [that] gave me the motivation." Lara has always written a blog but, recently, she began uploading videos discussing her recovery and documenting her journey. One film has attracted more than 18,000 comments and she now has more than 50,000 followers. "I'm lost for words to say the least," she said. "I know where I was and I know how severe depression can get. "I know how it feels like to be in the darkest pit and you feel like you can never get out of it. "Sometimes I reflect on it and it's something I can't really comprehend myself. "But it is certainly a pat on the back moment. I'm very happy." If you need support with eating disorders, help and advice is available here.